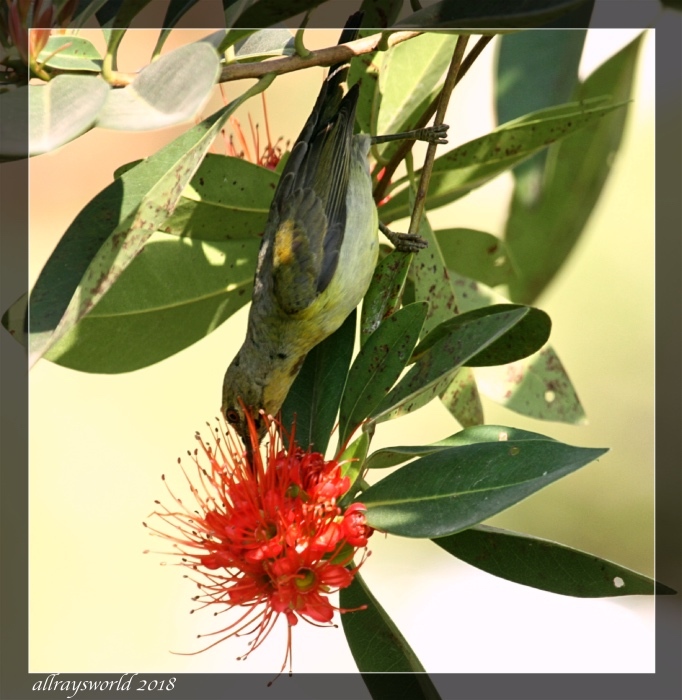 Here is a mini-series, featuring the Sunbirds that are presently nesting in our garden, whilst also living mainly off the nectar they harvest from one small shrub we have planted not far from our front steps...the shrub's popular name is "First Love"! The first couple are the Brown-throated Sunbird. The male [top image] is most handsome. The female is elegant and hard-working. Seeing them both together on the shrub suggests they already have chicks in the nest. Ooooh - aren't they purdy! I love your photos - and the pics are extra great because of how tiny these creatures are! Ray: Lovely critters, and great fun to observe, Elizabeth. A handsome fella, Ray, nice photo's. Ray: He's a flashy dresser, Frank! Quelles jolies photos ! Les oiseaux sont de toute beauté. Ray: Les mâles, en particulier, sont très colorés, Martine. Ray: Sunbirds are very active critters, Lisl, and very small too. How lovely, Ray. It looks like you'll have your work cut out for you. Ray: I try to not spend too much time near them, Ginnie, as the cats catch on quickly. These are amazing pictures, Ray. What to treat to have this at your fingertips. I am glad 'mom&dad' work together. Ray: The Sunbirds are great to watch, Astrid...Mum and Dad are extremely busy as the chicks grow. Ray: Merci, Claudine. Je suis ravi que ces oiseaux nichent et se nourrissent dans notre jardin. Demain, une espèce différente. wonderful images of the birds! Ray: The garden is working well, Chris...attracting all manner of attractive guests. So lovely to this happy couple in your garden and how they feed of the shrub close to your mansion. I hop that they are out of the reach of the cats. Ray: Brownie spends some time laying in hiding not far from the shrub, Alan, but the birds are vigilant so things might be ok.
Colour wise this is almost a fauvism painting Ray. Ray: That Matisse was a bit of a bugger with his paintpots, Chad, but Ms Nature beat him to it! The birds and shrub are tropical wonders that I appreciate seeing in the middle of February. Love how the missus looks in her upside down position. Ray: The nervous blokes are more into grab&run eating, but the gals are much more elegant feeders, Mary. You are so lucky, apart from a resident pair of Pigeons on the feeders during the summer we get very few birds in our garden. Ray: I certainly feel fortunate about this, Brian. Ray: They are lovely birds, Tom. Hidden in the leaves... very nice! Ray: Eating is a precarious business, Larry. Ray: The Sunbird family are quite spectacular little boids, Bill.